Posted August 29, 2017 & filed under The Writing Life. The amazing Kate Messner has once again launched KidLitCares, in order to benefit those who have suffered through Hurricane Harvey along the Gulf Coast. A huge number of authors and illustrators and their agents and editors – almost 200 total! – have offered services to those who make a tax-deductible donation to the American Red Cross. [Edited to add – you can choose to donate to the Hurricane Harvey Relief Fund if you prefer.] Services range from authors, editors, and agents who will review manuscripts, to authors who will donate their books plus Skype visits to libraries or classrooms. There are many opportunities for you to donate, feel great about helping – and benefit your students and/or your career. Please visit the site and bid on these amazing offerings. The auction ends Tuesday, September 5 at 9pm EST. And, this former Texan thanks you from the bottom of her heart. A New GET ORGANIZED Edition! Posted August 1, 2017 & filed under Book News, For Teachers & Parents. 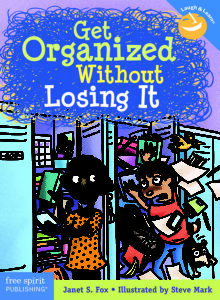 My very first published book, GET ORGANIZED WITHOUT LOSING IT, came out from Free Spirit Publishing in 2006. Happily, this little study skills and organization tool for middle graders has done extremely well, with more than 60,000 copies in print and editions in seven languages. Free Spirit felt it was time to update the book with some new material and new illustrations. So – ta-da! – here it is! With fabulous cover and illustrations by Steve Mark. This new edition officially releases in mid-August, but you can find it on Amazon here, and order directly from Free Spirit here. And if you would like a signed copy, you can contact my hometown indie bookseller, Country Bookshelf, and we’ll get one out to you. Free Spirit is also offering a Goodreads giveaway of 5 copies, running from August 3 through August 21. And later in the fall, I’ll offer a giveaway of my own. 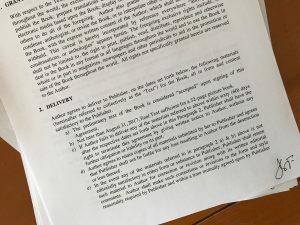 Here’s a bit more about the book. The new edition features the same popular format, including pages that may be photocopied and lots of humor to guide kids through what might otherwise be the dull but necessary skills to succeed in school. I’m very proud of this little book and its awards, but mostly I’m delighted whenever a student contacts me to let me know that GET ORGANIZED WITHOUT LOSING IT has helped them navigate the sometimes difficult waters of middle school. Posted June 13, 2017 & filed under For Teachers & Parents. 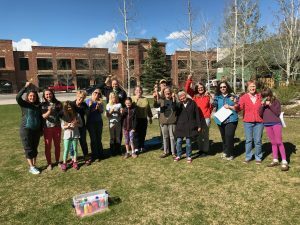 This excellent post from Nerdy Book Club reminds me once again of the importance of author school visits. The post is written by a teacher, describing the enormous impact an author can have on a school – teachers discussing the presentation, students lining up to read, and students determined to write and illustrate their own work. As a children’s author, I see this from the other side. I can attest to the rapt joy on a child’s face when they are given a glimpse into the world of story. I’ve exchanged correspondence with more than one reader fan after a school visit, and have watched from afar as that child matures into a serious writer. I know that by bringing my love of story-telling into a classroom I’m having a profound impact that will ripple for a long time. One of the messages I bring to kids is that we each have our own unique story to tell. At a recent school visit, as I said this and pointed to kids, telling them that, yes, “You and you and you each have your own story to give to the world,” one boy shook his head, no. How will he learn to believe in himself without examples? I hope that by the end of my talk, as I gave him tools by which to find his voice, he felt differently. 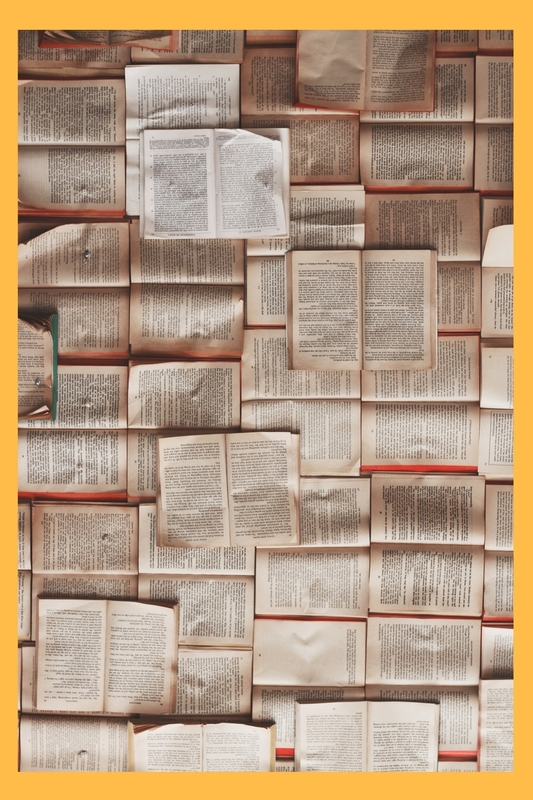 I know that just by being there, as a published writer with a love of expression (and as a former teacher), I offered a very different way of seeing reading and writing than what can be delivered through lessons and homework. If you are a teacher or librarian, please contact me with questions. Posted May 23, 2017 & filed under Book News, THE CHARMED CHILDREN OF ROOKSKILL CASTLE. Contract for THE LAST TRUE KNIGHT – yay! First, I’ve signed the contract for THE LAST TRUE KNIGHT. I’m very proud of this story. 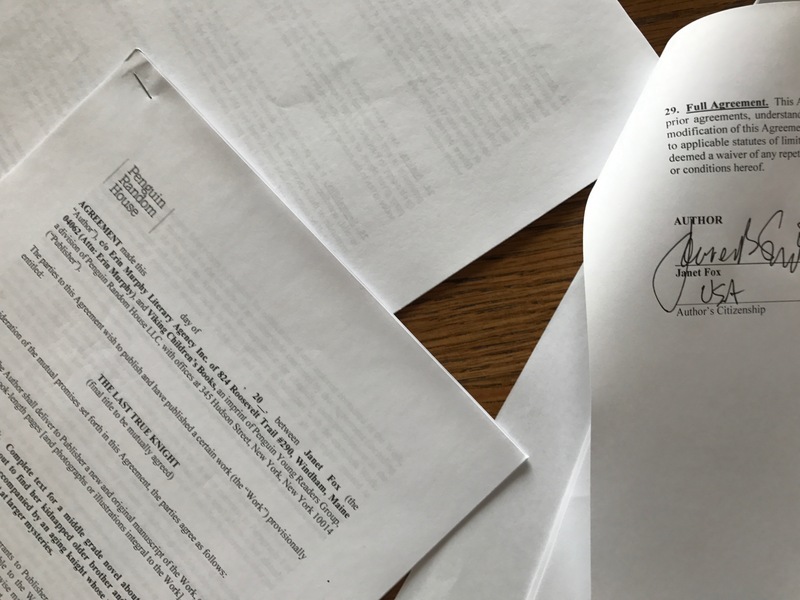 A girl who has visions, her brother who has been kidnapped, a mysterious knight, witchcraft, belief, a country in jeopardy, magic, dragons, the stars………………..
Second, I signed another contract that I can’t reveal just yet but is something dear to my heart. Let’s just say there’s a debut picture book in the works. Yes, an award, and such a special award it is. 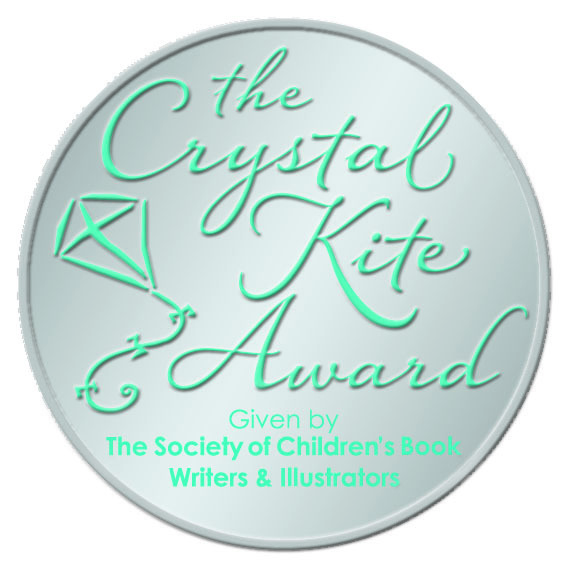 It is the acclimation of my peers, with the awarding of the Crystal Kite Award for THE CHARMED CHILDREN OF ROOKSKILL CASTLE, in the western states region. This means so, so much to me. Especially since it’s from members of SCBWI, the organization that is the foundation of my career. 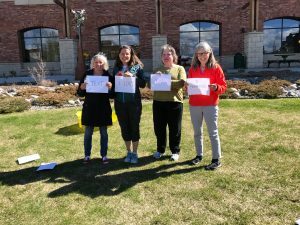 I look forward to celebrating this wonderful award with Montana SCBWI members, and beyond. Thank you all. Because without you – readers and fans – I wouldn’t be sending new books out into the world. 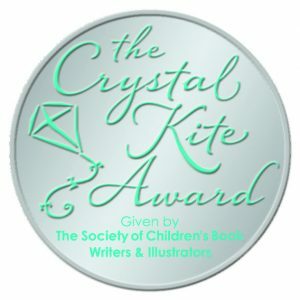 I wouldn’t be deeply thrilled by awards, like the Crystal Kite. So, THANK YOU!! 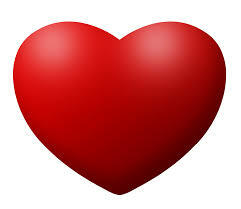 I love you all!! Posted May 2, 2017 & filed under The Writing Life. At 4:29 on 4/29, we all texted “I love you” to someone. Some days are like that. You swing from one emotion to the next. And then you stop and take stock and realize there are lessons to be learned. The Beckoning crowd blowing bubbles. Last Saturday was one of those. 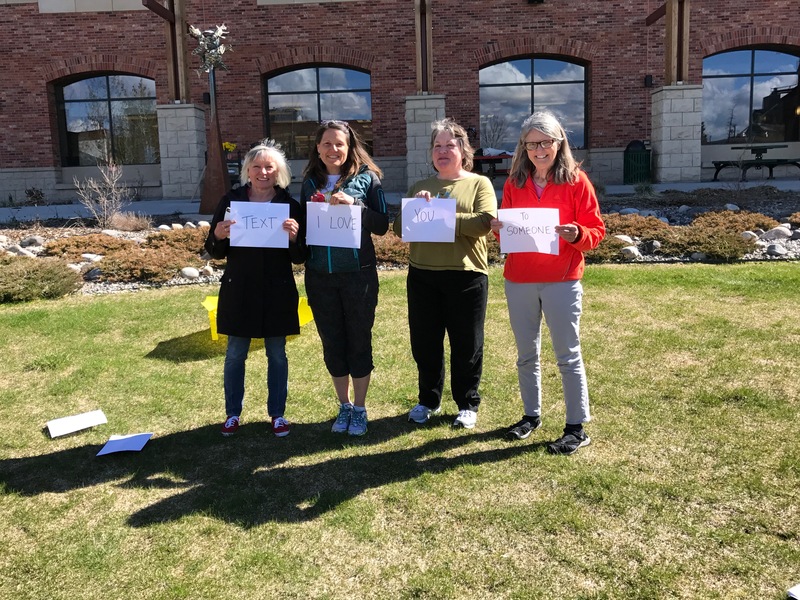 It was Indie Bookstore Day, and I was fortunate to be a guest bookseller for a few hours at my favorite indie, Country Bookshelf in Bozeman. It’s a job I love – picking out the right book and putting it into the hands of an eager and grateful reader. And it doesn’t hurt that the folks who work at Country Bookshelf are simply the best. It was sweet, sad, joyous, and felt remarkably good. 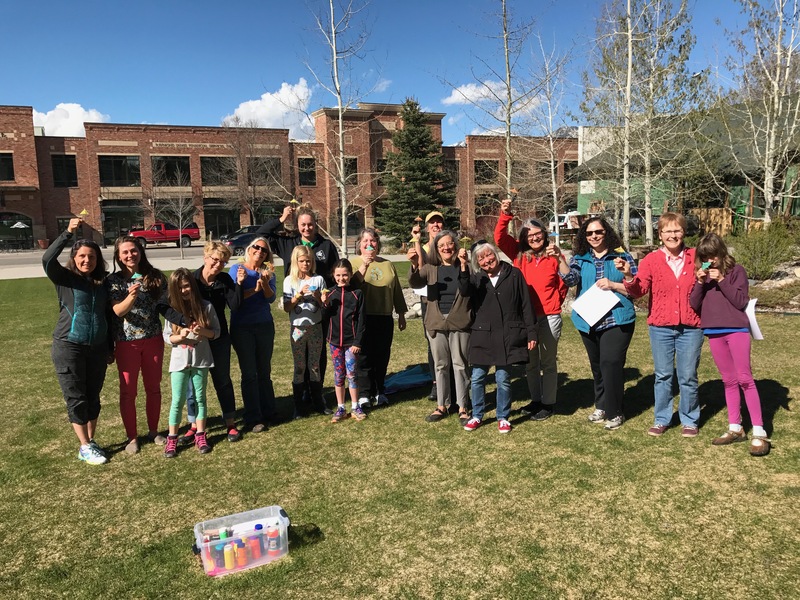 We had met Amy, who was a prolific author of many acclaimed children’s books, when she came to Bozeman for the Library’s Children’s Festival of the Book in 2014, so her passing was truly personal and this celebration was, too. Country Bookshelf contributed a ton of books, which at the end of the event we packaged and left for people to find around town. Only a week earlier, our area lost another remarkable author, William “Gatz” Hjortsberg. Not only was he an incredibly talented writer, he was one of the most generous people I’ve ever met. His huge heart had room for everyone. When he walked into a party everyone lit up with joy. And, boy, could he tell a story. They were each, in their own way, Amy and Gatz, people who gave life their all. When we parted from the Library’s Gathering, librarian Cindy Christin handed each of us this card. I’m keeping mine on my desk, where I will look at it every day. It’ll remind me of Gatz, and Amy, and what truly matters. Wishing you a host of Lovely. Posted April 11, 2017 & filed under The Writing Life. I’m in the midst of a difficult revision. Difficult, because like many of you, I’m very distracted by the world’s goings-on. And difficult also because I’ve been challenged to amp up the work with this next draft. To go deeper, exploring characters and theme more fully, and adding tension to that dreaded middle. I’m not complaining about the challenges, mind you. I want to write the best possible novel, one that expresses my most profound feelings – and those of my characters – while saying things that need to be said, all without didacticism or obviousness or shouting from the platform. As agent/author Donald Maass has written so eloquently, authors are responsible for crafting books that uphold basic principles of honesty, compassion, and hope. This is especially true, I think, for those of us who write for children. So my so-called message cannot feel like a message, yet must convey those principles through subtext and character behavior all while my story grabs the reader and yanks her along with energy, mystery, and surprise. I’m one of those writers who has to write every day. If I don’t put words on paper I feel like I’ve dropped the ball. But sometimes, in trying to write the best words, silence is required. Sometimes it’s necessary to step back and not write. To just let the thinking happen without the effort. To ask my subconscious to work while I dream, or to doodle and noodle until the ideas pop. Walking is very good for this. So is gardening, I find, and in the winter, knitting or making music or sketching. Sometimes travel helps. And sometimes, just sitting and staring into the distance – that thing I find hard to do. I’ve been doing all of these, trying to get everything to gel, knowing from past experience that once it does, the writing will come fast and furious. It’s very difficult, this stepping into silence, especially right now. So forgive me if I do go silent for a bit while I noodle and doodle. I hope that the rewards of this silence will be great. Posted March 28, 2017 & filed under For Teachers & Parents. As a former middle school and high school teacher, I know how valuable simple tool kits are – especially tool kits that provide a lesson plan that’s fun, engaging, and informative. 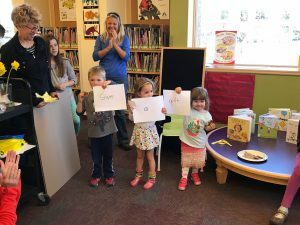 That’s one huge reason why I partnered with Curious City to create a website for THE CHARMED CHILDREN OF ROOKSKILL CASTLE that includes an event kit for librarians to help teach library search skills. Curious City has gone one step further in helping teachers and librarians by creating a month-by-month programming guide to all the specialized holidays and events you can imagine. There’s something for everyone in this wonderful new aid to teaching. Now…I’m off to the Olympic National Park to research my latest project! Posted March 7, 2017 & filed under The Writing Life. The number one question would-be and new-be children’s book authors ask authors like me is (no surprise) “How do I get my work published?” I understand, because I asked the same question when I was just starting out. Here’s the thing: the publishing industry is a bit of a different animal than most. There’s no “shark tank”, no product application, no routine “I’ve got this idea” pitch forum. You can’t just walk into a publishing house and ask to meet Editor So-and-so. If you want to be published by a traditional house, whether one of the big five New York houses or one of the myriad smaller presses, there are certain ways to approach the business today. 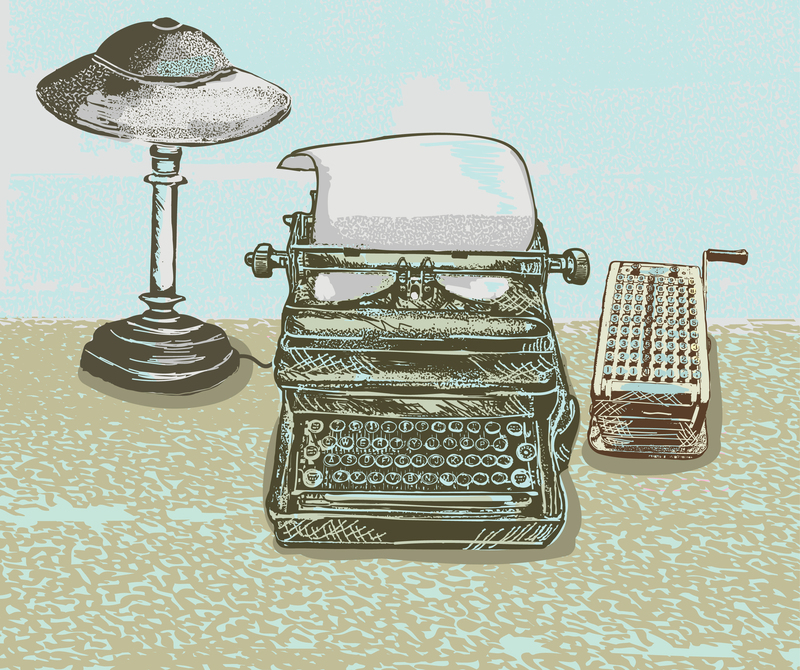 Today, many traditional publishing houses and editors are closed to unsolicited submissions. Some are still open, but you must know which ones and what their submission requirements are. Many prefer email submissions; some have reverted to hard-copy with SASE (self-addressed stamped envelope) submissions. Some accept queries only. Some accept queries and the first ten pages or three chapters. Some want the entire manuscript. And many houses are closed, which means you must first find an agent to represent your work, which is just as difficult as finding a publisher. If you want to become a traditionally published children’s author, here is what I can recommend. The primary resource for information on the publishing industry in the children’s field is the Society of Children’s Book Writers and Illustrators (SCBWI). If you are at all serious about being published, you should join. They provide mountains of information, including details about agents and editors and what they publish, how to submit, and who they represent. On a personal note, I would not be published today without SCBWI, and have been involved in the organization since my early writing days. 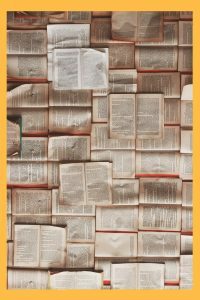 Chuck Sambuchino’s Guide to Literary Agents blog is also an excellent resource for news and views related to literary agents. 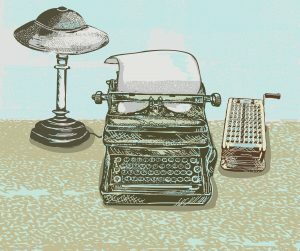 http://aaronline.org/ A professional organization of over 400 agents who work with both book authors and playwrights. Members must meet the highest standards and subscribe to the Canon of Ethics. Posted February 28, 2017 & filed under Writing Craft Tips. Lately I’ve discovered some new writing craft books that have become staples of my reference shelf. I wanted to share my impressions of these recent releases, so I hope you enjoy. 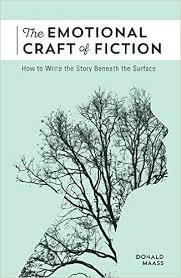 THE EMOTIONAL CRAFT OF FICTION: HOW TO WRITE THE STORY BENEATH THE SURFACE, by Donald Maass (Writer’s Digest Books, 2016). I’ve long been a Donald Maass fan, and pretty much use every one of his craft books repeatedly, but this newest release is absolutely stellar. As usual, Maass sprinkles his essays liberally with exercises that can be applied to your work in progress. But the most important aspect of this newest work is that rather than dealing with the architecture of story-telling (i.e., plot, pacing, character, voice, etc.) Maass tackles the nebulous yet essential emotional journey the writer must invoke in the reader. I’ve long been a fan of brain science and have read a number of articles on the importance of story-telling to us humans, but this is the first time I’ve read a craft book that tackles the “how-to” of invoking our reader’s deepest emotions and tapping into our primal story-loving needs. 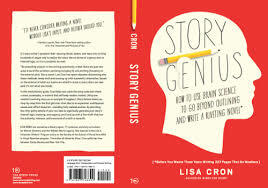 STORY GENIUS: HOW TO USE BRAIN SCIENCE TO GO BEYOND OUTLINING AND WRITE A RIVETING NOVEL, by Lisa Cron (Ten Speed Press, 2016). And speaking of brain science and story-telling…I read these two books back to back. They are a marriage made in heaven. It’s almost as if Cron and Maass were channeling one another. The difference is that Cron – w ho also plants exercises throughout – first taps into the character’s emotional journey through life and how that applies directly to her story, and then, in the second half of the book, delivers a very specific template for crafting a first draft based on the emotional path of the character. For me, the second half of this book didn’t work because I’m a die-hard pantser and abhor any boxed-in template. But the first half is dynamite. And if you like planning and outlining, you may love the second half, too. 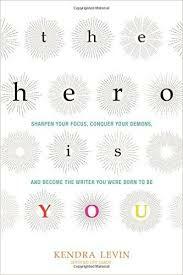 THE HERO IS YOU: SHARPEN YOUR FOCUS, CONQUER YOUR DEMONS, AND BECO ME THE WRITER YOU WERE BORN TO BE, by Kendra Levin (Conari Press, 2016). Full disclosure: Kendra is my editor at Viking Children’s. I totally love this book. And…surprise! It’s another book about how the brain works and how we writers must harness our individual emotions as the heroes of our own journeys. Kendra has also created numerous exercises to help writers cope with those ever-present nay-saying internal demons, and her research and anecdotal examples are fascinating. Kendra is also a certified life coach and I’ve participated in a coaching workshop with her, and if you are a writer – or any artist – wh o is struggling with self-doubt or fear, I recommend both this book and her coaching. And one that I’m looking forward to…. 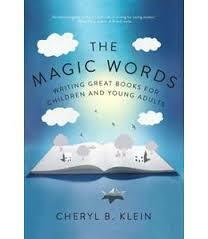 THE MAGIC WORDS, by Cheryl Klein (W.W.Norton, 2016). I’m a fan of Klein’s SECOND SIGHT, so I’ve just put this one on order. When I heard Klein’s lecture at last year’s New York SCBWI conference, I came away with pages of notes. I’ll let you know what I think! What about you – do you have any recommendations for new craft books?